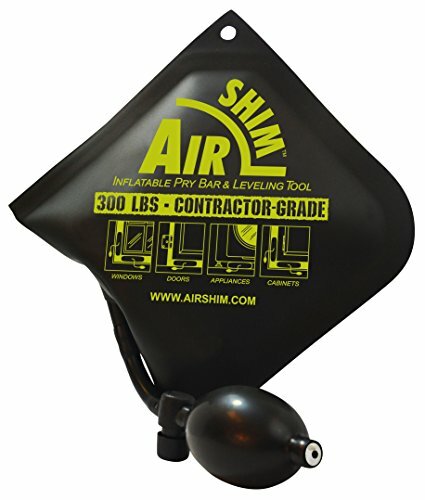 "The New AirShim inflatable pry bar and leveling tool is designed for professional users. The AirShim allows a single installer to position and hold items in place, saving jobsite time and reduc¬ing labor costs by providing a much-needed extra hand in installations. It’s perfect for window and door installers, interior construction professionals, installers of appliances and small equipment, other skilled craftsmen and serious DIYs. CONTRACTOR GRADE FEATURES -- Professional level 300 pound load capacity certified by SGS. Fully inflated 2.5” gap-spanning capability means greater lifting range and the ability to handle more jobs. Rounded corner and internal “stiffener” allows the AirShim to be inserted (crammed) into tighter spaces without bending. Won’t fold under pressure. Backed with a 1-Year Warranty. LIFT, SHIFT, ALIGN, LEVEL and PLUMB -- by utilizing multiple AirShims below, above, left and right of heavy objects you can fine-tune their positioning with easy adjustments from all 4 sides resulting in faster, more secure placements. SIMPLE ONE-HAND OPERATION -- AirShim’s powerful hand pump inflates to lift or move loads, while the precision bleed valve button allows for simple one-handed adjustments and deflation. REDUCES SURFACE DAMAGE -- Unlike wooden shims, wedges and metal pry bars, the AirShim poses no risk of damage to surrounding surfaces. SO MANY USES, YOU’LL WANT SEVERAL -- the more you use AirShim the more uses you will find! Appliances, Beams, Cabinets, Doors, Equipment, Furniture, HVAC, Plumbing, Joists, Countertops, Mantels, Bathroom Fixtures, Curtain Walls, Flanges, Windows, and more! Soon you will wonder how you ever did without them! Click Add to Cart to get yourself 1 or more AirShims today! Copyright 2017 Calculated Industries. All rights reserved. "